The original Ariel Atom will forever be synonymous with that image of Jeremy Clarkson on track. You know the one. His face was turned to jelly as the sheer speed contorted every muscle. Clarkson’s mouth was akin to a hippo’s yawn and his many chins tried their best to strangling him as he drove the Atom at Top Gear’s Dunsfold test track. To the casual observer, the car is nothing more than an impractical lump of strategically welded scaffolding poles. There is no protection from the elements and it’s hard to explain to the uninitiated how this machine would offer any degree of driving pleasure. However, I can steadfastly attest that the Ariel Atom is engineering genius that defies all logic. A thoroughbred racing car, but yet it has normal road car trappings like lights and number plates! The Ariel Motor Company based in Somerset, are not a new company by any stretch of the imagination. Their heritage lies with two wheeled machinery. In the last decade they became renowned for building motorbikes, before branching off in to the automotive world with the Atom and the Nomad. The Atom, for all its celebrated reviews and cult status remains an incredibly rare car. Few Ariel Atoms reside in Ireland and in that respect I assumed getting close to one with the camera was never achievable. 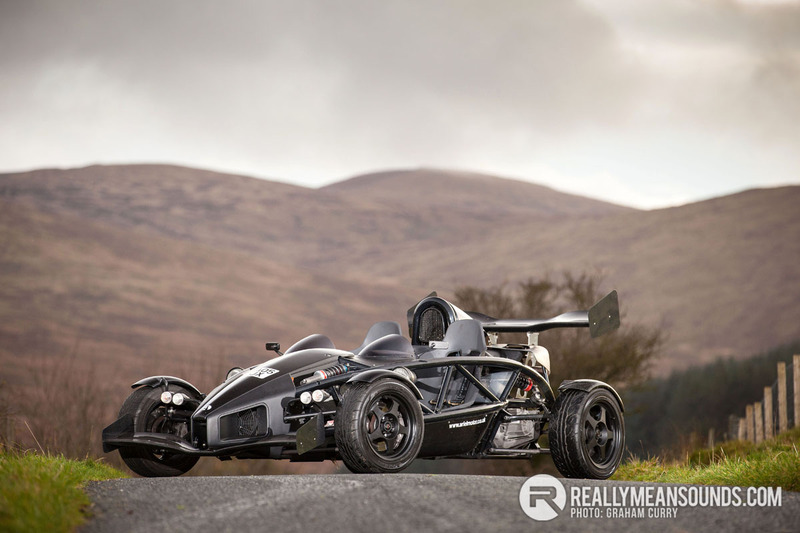 But after a month of planning and calling off the job several times due to the weather, last week on a mild but breezy autumn morning I set off to one of the most picturesque scenes in Ireland to meet Tony Greenan, the proud owner of this Ariel Atom 2 300. I was going to get to put this beast to the test in the best proving ground possible – the fast undulating roads that the Mourne Mountains in County Down. Tony is no stranger to fast cars and has raced on and off for years. His previous project was a BMW E30 running a supercharged Honda Engine. He entertained the crowds for a couple of seasons and accrued a few trophies along the way, but he decided it had to go and make way for something a little more capable and track orientated. So, when the Atom came up for sale, it fulfilled the criteria and more. Greenan struck a deal for the car and hasn’t looked back since. He has no need to in fact as he is so far ahead of the competition now with this car and it is possibly the only one in Ireland built to such a high specification. Weighing in at just over 500kg there isn’t much to the Atom other than the bare necessities. In reality, this is what the Atom is all about, it’s like a road legal formula racing car with 300bhp to boot. This power is provided by the high revving, highly reliable and rear mounted Honda K20 engine which is accompanied by a Jackson supercharger for that low down grunt before the V-Tec kicks in. Ten way adjustable Bilstein coil over suspension allows for a huge range of adjustment and Tony can play about between road and track settings very easily. There is an upgraded limited slip differential which helps get grip to the ground and when cornering hard there is slim chance of an oil surge due to the baffled oil sump. With huge speed and not a great deal of weight, brakes on these kinds of cars are quite small however the Alcon 4 pot callipers all round with bias valve in the cockpit provide a mega amount of stopping power and more than anyone would ever require. Tony recently fitted a set of super lightweight Rota Slimstream wheels (specifically made for the Atoms) which are split sized and split widths for optimum handling and grip (15”x7” front and 16”x8” rear) all wrapped in incredibly sticky Yokohama AD08 rubber. Aero on this car is aided with a hugely expensive plethora of carbon fibre. A racing car style front splitter and rear spoiler help balance the Atom at speed and keep it well planted to the road. Inside the Atom is very basic. A large plastic mould makes two seats and the centre console whilst there is somewhat of a digital dash, with weather proof switch gear tucked behind the removable steering wheel equipped with shift lights. Now onto the important part, the driving! Having driven some pretty heavily tuned cars, rally cars, kit cars and super cars in my time, both on road and track I was excited yet very nervous. My instructions: “Make sure you reach 9,000rpm”. So off I set on a journey to 9,000rpm at the foot of the Mourne Mountains. With the winter roads, it only meant one thing, wheel spin and gentle opposite lock to cope as the rear end snaked down the road and I pulled a grin that would have rivalled the Clarkson hippo-mouth. Once I composed myself, I found that even fourth gear offered minimal amounts of grip. Gears came and went as the revs rose. I was absorbed and involved in the driving experience, without actually realising the sheer speed of this car. With 0-60 in less than 3 seconds and 0-100 in under 7 seconds it’s hypercar territory. This alone made me realise just what an incredible piece of automotive engineering the Ariel Atom is. When Tony asked me what I thought; I was genuinely speechless, this is the only car that has ever left me lost for words, it is that incredible! Great article @Graham , what a beast of a thing. I'd love a drive in one. After being in Tony's E30, I can really see why he went for this, as I'm sure there wasn't many other 'sensible' options out there. I would love a run in it, looks like an absolute hoot. Any video G? | After being in Tony's E30, I can really see why he went for this, as I'm sure there wasn't many other 'sensible' options out there. I would love a run in it, looks like an absolute hoot. Any video G? Thats such a brilliant write up @Graham well done mate . Really is a class machine men. Soon as the weather picks up i think i will try it in the rallysport association championship, i would stick to the tracks only thou as they run nutts corner and mondello. | Thats such a brilliant write up @Graham well done mate . Really is a class machine men. Soon as the weather picks up i think i will try it in the rallysport association championship, i would stick to the tracks only thou as they run nutts corner and mondello. Love it. @evo98 should consider joining Uber so we can all get taxi rides.